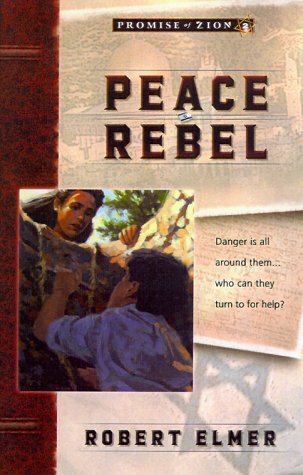 Clean, fun, and an adventure about discovering peace in peaceless times. Dov Zalinski and Emily Parkinson are whisked away from the beach they landed on to a Jewish community farm, Kibbutz Yad Shalom. Dov itches to continue the search for his family and Emily is desperate to go home...even more so when things go especially awry for her. Dov finally hitches a ride to Jerusalem with four Americans, but finds himself thrown into the drama of Emily's life. Most of the folk at the kibbutz are kind and all are willing to help the illegal immigrants among them. The American visitors are also more than willing to help in whatever way they can. Despite her harsh words spoken in anger, Emily tries to assure Dov that her British major father would treat him fairly. Despite Dov's habit of caring only for himself, he helps when it matters most. The Americans and a few Jews at the kibbutz are active Christians, complete with open prayer and Scripture-quoting. Emily prays a little more; Dov follows along in a it-wouldn't-hurt fashion. Dov and Emily are dumped into the truck that takes them to the kibbutz. The truck - and later a cow and the Americans' car - is shot at by Arabs. Angry Arabs surround the truck and threaten to tear it (and likely its occupants) apart. Dov has a run-in with a barbed-wire fence. He has brief flashbacks of the death camp. He jumps out of the way of a speeding car. Emily is held at gunpoint a few times, threatened, and bound in a chair as her life is bargained for. She is yanked to the floor at one point and pursued when she attempts an escape. The bombing of the King David Hotel and the death camp Dov survived are mentioned. A Jewish terrorist smokes incessantly (this is frowned upon). Another artful tale by Robert Elmer. He follows as many facts as he can (explaining a little more in his end-of-the-book blurb) and gives the reader an exciting story leaving them wanting more of Dov and Emily.